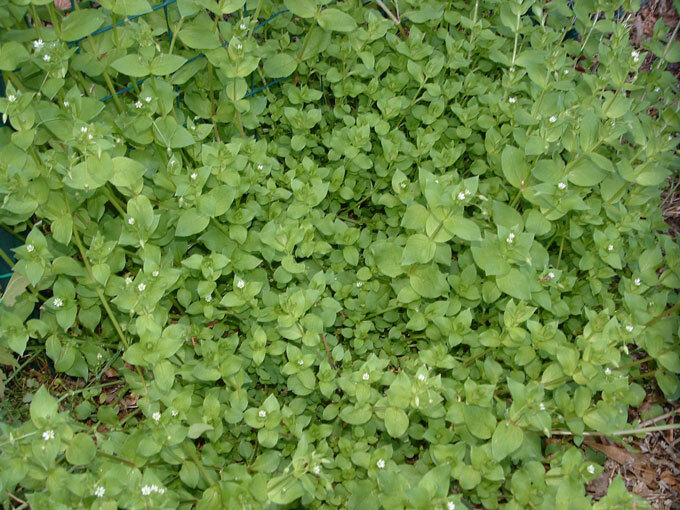 Here’s an excerpt from a Piedmont Biofarm CSA blog post by Elizabeth Thompson, who shares my deep affection for a certain subterranean food stock. 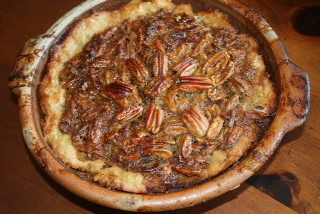 “Moving here from the North, there were a number of farm favorites that I lost. Brussels sprouts so sweet you can eat them raw, rhubarb by the armload for pies and jams, and crisp greens all summer long. But it was a trade, and some wonderful vegetables have found their way into my southern life to replace the cool northerners I lost. Among these are okra, peppers and tomatoes out my ears and, my favorite southern crop so far, the South American native sweet potato. I always love the thrill and satisfaction of digging up potatoes from their summer lairs and piling them by the bucketful into the basement for our winter staple. There is something even more thrilling for me about digging up the golden gems of sweet potatoes that seem to have preserved the summer sun’s life-giving energy so perfectly within their sweet, orange flesh. 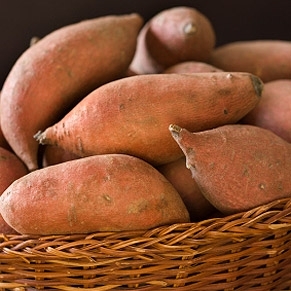 Click here for Elizabeth’s advice on how to store sweet potatoes and cook them (with recipes for Cajun Roasted Sweet Potatoes and Hot and Sweet Gratin). 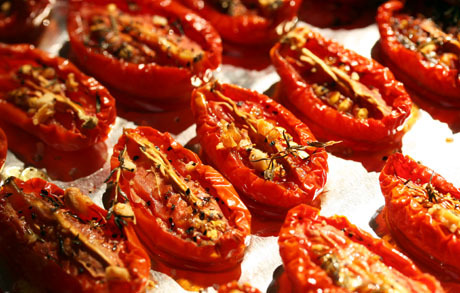 You bought it so cook it: I love what Linda Watson is doing with her Cook for Good lessons: proving that you can eat fresh, local, sustainably grown food, even on a food-stamp budget — if you cook it yourself and use all of it wisely. 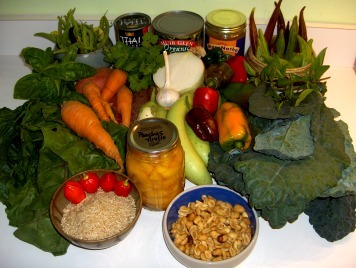 She will show you how to save time and money while eating delectable fare in a way that’s good for you and the planet. Saturday June 12, 2-3 p.m. at Chatham Marketplace in Pittsboro. $5 for CM member/owners, $10 general public. You must pre-register, call 542-2643. Carrboro Urban Farm Tour: More than 15 backyard gardens and food enterprises will be open for inspection for the third annual urban farm tour in Carrboro, the Paris of the Piedmont. I participated last fall and loved visiting community gardens, all kinds of intensive vegetable beds, apiaries, chicken coops, and an artisanal bakery at a co-housing neighborhood. Saturday June 12, 2-6:30 p.m., including walking and biking tours and a potluck supper at the end of the day. Pick up maps at Carrboro Raw, across from Weaver Street Market. Potluck in the Pasture: When local artists, foodies and farmers converge, the result is pure pleasure. 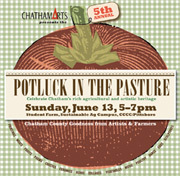 ChathamArts presents the 5th Annual Potluck in the Pasture, featuring local author Clyde Edgerton, music by Kickin’ Grass, and a chance to meet plenty of other local artists. Stonemason Joe Kenlan and Greek food goddess Angelina Koulizakis (Angelina’s Kitchen) will be running the wood-fired pizza oven with fresh dough from My Neighborhood School and fresh ingredients from the garden. Bring a potluck dish to share or plan to purchase fresh produce at the market on site, and enjoy getting a tour of the sustainable student farm and herb garden. Admission is $8 at the door, $5 online, kids under 10 free. Sunday June 13, 5-7 pm, Central Carolina Community College in Pittsboro.